Bankart Lesion - Definition & Causes (Video) - Jeffrey H. Berg, M.D. In a previous post, I discussed what labral tears of the shoulder are and what common symptoms they cause. A Bankart lesion is a particular type of labral tear of the shoulder. It has some unique characteristics. When the labrum gets injured, it often rips within its substance or from its attachment. That’s a labral tear. Labral tears are often described by their location. When the labrum at the bottom front of the joint is torn from the socket, that’s called a Bankart lesion. You may recall from another post that the main shoulder joint is comprised of the humerus (ball) and the glenoid (socket). These two structures are connected to one another by firm bands called ligaments. These ligaments are the main stabilizing structures of the shoulder. They attach to the glenoid at the labrum. The labrum is a thickened cartilage ring that is firmly attached to the surface edge of the pear shaped glenoid. A Bankart lesion results when the labrum at the bottom front of the glenoid gets torn from the cartilage and bone. View the video below to see the arthroscopic appearance of the normal labrum and a Bankart lesion. On occasion, the labrum is not simply torn from the glenoid. 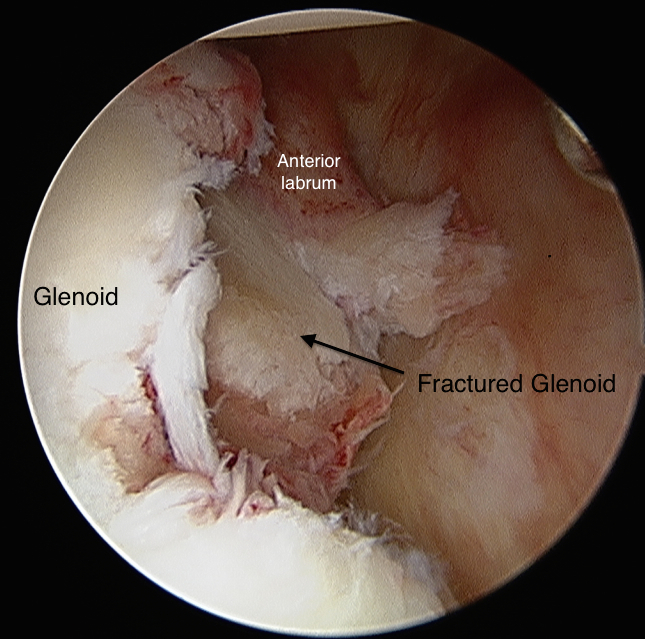 Rather the glenoid breaks (fractures) and a bone fragment with the attached labrum is separated from the glenoid. This is called a Bony Bankart lesion. Why is a Bankart lesion a problem? Since the ligaments in the front of the shoulder are attached to the labrum and since, when a labral tear occurs, the labrum is no longer attached to the socket, the ligaments can no longer stabilize the front of the shoulder when a Bankart tear exists. As a result anterior instability occurs. 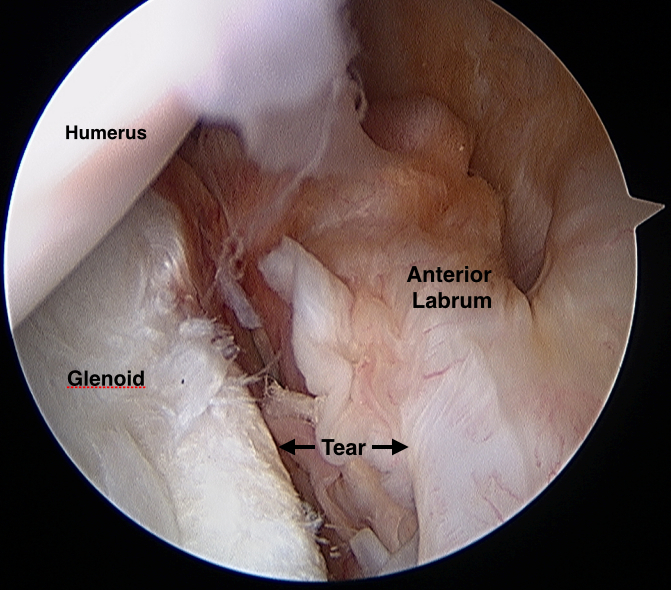 On occasion the Bankart lesions can be more extensive, extending into other areas of the labrum around the glenoid. Additional injuries can also occur. 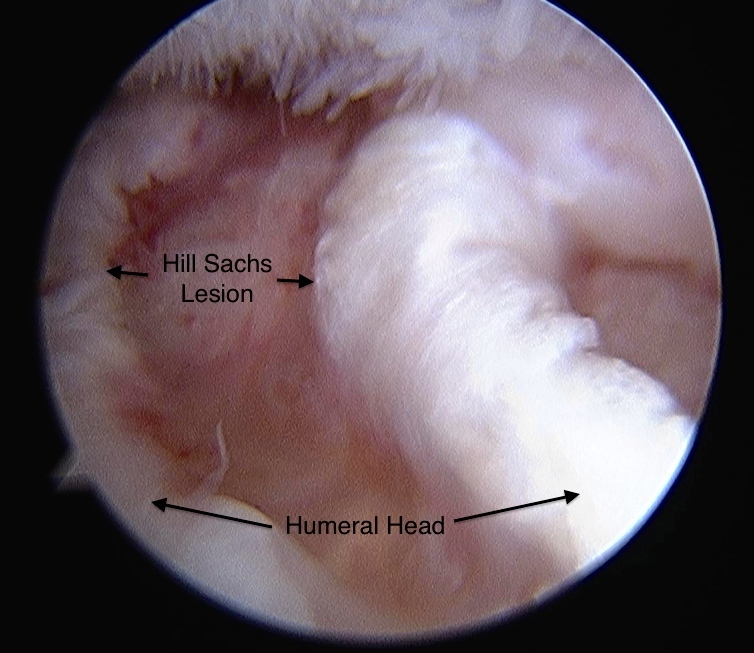 Of these, tears within the substance of the ligaments or at the humeral ligament insertion (HAGL lesion) or an indentation to the bone of the back of the humeral head (Hill Sachs Lesion) are most common. These variations can affect the degree of instability and result in additional symptoms. They can impact the recommended treatment as well. By far, the most common cause of a Bankart lesion is a traumatic anterior instability event, either a partial displacement of the humeral head off of the glenoid (subluxation) or a complete displacement (dislocation). Typically this occurs with the arm positioned such that it is overhead or away from the body at the side (as if you were raising you hand in class). While in this position, a force is directed to the arm from front to back. This wrenches the humeral head forward, into the anterior ligaments. This then violently “pulls” and ultimately tears the labrum from its glenoid attachment. 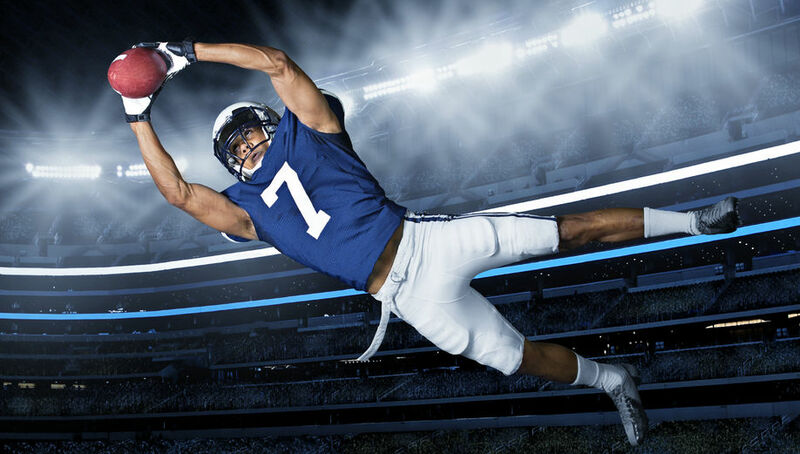 Common causes of these injuries are tackling in American football, going up for a contested rebound in basketball or while wrestling. These injuries may also occur with non athletic activities that have similar mechanisms of injury. In the following video, a wrestler (in gray singlet) dislocates his left shoulder (@ 1:19 secs). If you’ve been told you have a Bankart lesion, particularly if you are young and involved in contact activities, it is likely that you will need treatment. This would be a GOOD time to see a sports medicine shoulder specialist.